As we anticipated in the post on Facebook, today the Divine Rhythm Project enters a new phase. To taste the wine combining it with art, music and cinema was an idea started for the game, which then led us on an unexplored path that we decided to follow. As a sommelier (who for more time, who for less time) we tasted many wines (not only those that you can find reviewed on our portal). Since we had, however, the great musical competence of Nicola, co-founder of Ritmo diVino and Master of Music, we soon realized that the emotions produced by the nectar of Bacchus were not so different from those that can produce listening to a great piece. In fact, at a certain point we realized that there was a leitmotiv that brought us to combine wines that were similar to each other with music also these of the same genre. For example, a warm, alcoholic and conversational wine like Taurasi, has exalted us in listening to a warm music like Soul. In the same way, the Gragnano, sparkling and fragrant, seemed rightly matched with a Jazz Crossover, and emotionally pushed us, when we were more bored, to look for something that gave brio to the day. So we tried to elaborate a matching scheme between wine and music, which is based on a series of very clear principles, not so different from those that are used to combine wine and food. Let’s start from the concept that, at least on Ritmodivino, the speech pairing has an emotional foundation. Drinking wine, for us, is not only synonymous with good food, but it is also a way to feel and be comfortable with oneself and with those around us. It is a way to feel life in a different way. We know well that wine has an alcoholic component and we also know that drinking alcohol in high amounts is detrimental to the body. And we also know that alcohol is the first cause of death in the world. We know, however, that little wine of quality, drunk in moderate quantities, has significant positive benefits. Contains antioxidants, contains positive substances and even supplements. In addition, the wine has antidepressant abilities, and depression is one of the ills of our time. If wine, therefore, has all these qualities, why not use it in a positive way, combining with the other beauties of life, so as to make it a medicine of the soul? A good wine, a beautiful music and a nice company have the power to raise our spirits, so we thought to contrast the negative emotions with the characteristics that has a good nectar. If someone has a temporarily anxious mood, why not choose a relaxing wine and conversation? If you have a state of mind saddened by the daily labors, why not raise it with the musicality of a sparkling wine? In the same way, a positive emotion, like joy, can be strengthened and accompanied by the choice of a sincere and simple nectar that can allow the sense of optimism that we live temporarily to endure. Here we came to help the music too. 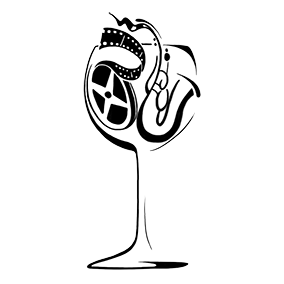 A passionate wine was often combined with vocal tracks, especially to vocal jazz, a type of music that provides an instrumental approach to the voice of those who sing, so that the latter is confused, and vice versa, with the sound of the instruments themselves. A sparkling wine, which crackles foamy in the glass, matches instead to Smooth, a musical genre born in the Sixties and that emphasizes the sounds of jazz and its melodies. So music with music! For now our work focuses on Campania and its wines. Campania is a region that we want to enhance its product with an innovative idea that, for once, bring the south in front of those who, his wine, has been able to enhance it for more time and above all with more courage. In Campania we have many treasures, but often our region hides them, you want for a sense of ancient resignation, you want for the confidential nature of the people of our hinterland. However, for us of Ritmodivino, Bacchus’s drink, music and cinema are great passions. And as not only passion lives the man, we are convinced that the project can meet the interest of other enthusiasts. Our goal is to broaden this work that we are doing on our region to others as well. In addition to launching a project of crowdfunding on to help fund the research expenses to which we will meet, we will continue to experiment.